December 22 at the Ranchos arena — Argentina, a fight took place among the boxers in the 1-m welterweight (up to 63.5 kg) — Martin Antonio Coggia Argentina v. Herman Benitez Argentina. 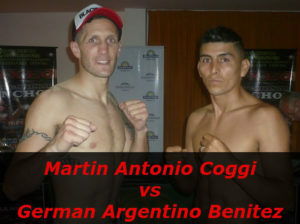 Martin Antonio Coggi vs German Argentino Benitez. The percentage of early victories Martin Antonio Koggi KOs 38%. The percentage of early victories Herman Benitez KOs 41%. The fight for the title of champion in the version of Vacant WBO Latino in the 1-m welterweight. Win to UD 10 for German Argentino Benitez — Won vacant WBO Latino Super Lightweight Title.